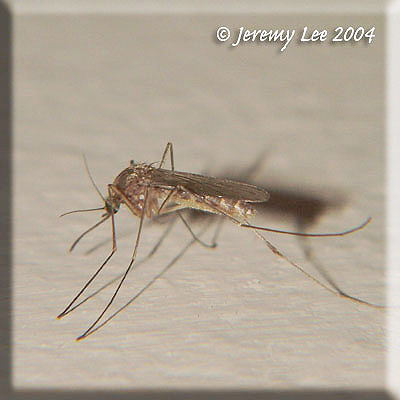 Culex pipiens, more commonly known as the common house mosquito, is a species of blood-feeding mosquito of the family Culicidae. Both males and females feed on various sugar sources, such as nectar, honeydew and juices from fruits, but only females feed on blood, and will do so preferentially, over sugar, when they have mated. Blood provides proteins essential to the development of their eggs. Their primary blood meal hosts are considered to be birds, but they will feed on humans and other mammals. A real city dweller, Culex pipiens lives in urban areas in temperate zones throughout the globe. Will readily breed in any standing water, the dirtier the better. Culex pipiens f. molestus lives in the London Underground and other underground railway systems world-wide. The more common Culex pipiens subspecies observed above ground is sometimes referred to as Culex pipiens f. pipiens.